Is your cat peeing on bed covers and throws from time to time? Or wetting his own bed, or even the dog’s? 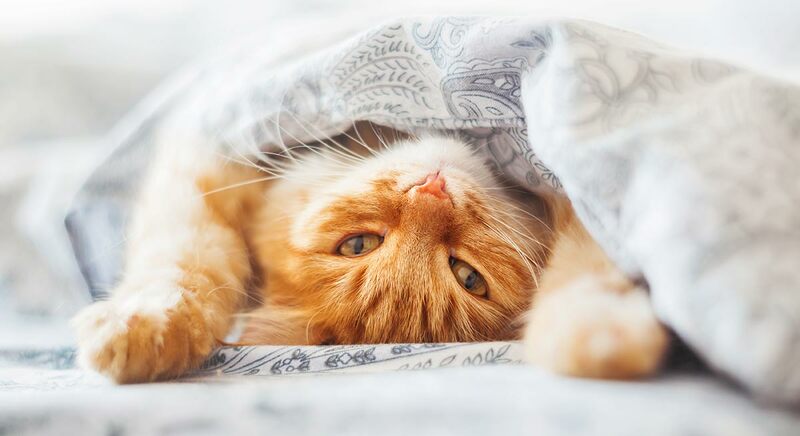 In this article cat behavior expert Clare Hemington takes a look at the reasons why, and most importantly how to stop a cat peeing on the bed. Imagine after a long day, you head off to bed only to find your favourite family feline taking a pee on your freshly laundered duvet. Or perhaps you’ve bought your cat a brand-new cat bed and he decides to thank you by squatting in it and taking a pee. You might even discover that your cat has been peeing in the dog’s bed! If you’ve been unfortunate enough to experience any of these situations, you’ll know how upsetting it can be and how it can affect your relationship with your cat. Not to mention all the extra work it creates washing the soiled items over and over. A quick internet search on ‘My cat peed on my bed’ or ‘Cat urinating on bed remedies’ will produce all sorts of information which may or may not be accurate. Or, you might start using second-hand remedies such as putting tin foil; citrus peel, pepper etc. on the soiled area. You might even decide to shut the bedroom door, throw away the cat bed or make the dog sleep on the floor. However, this is only likely to move the behaviour to another location, upset the dog, and doesn’t address the reasons why your cat is doing it in the first place. 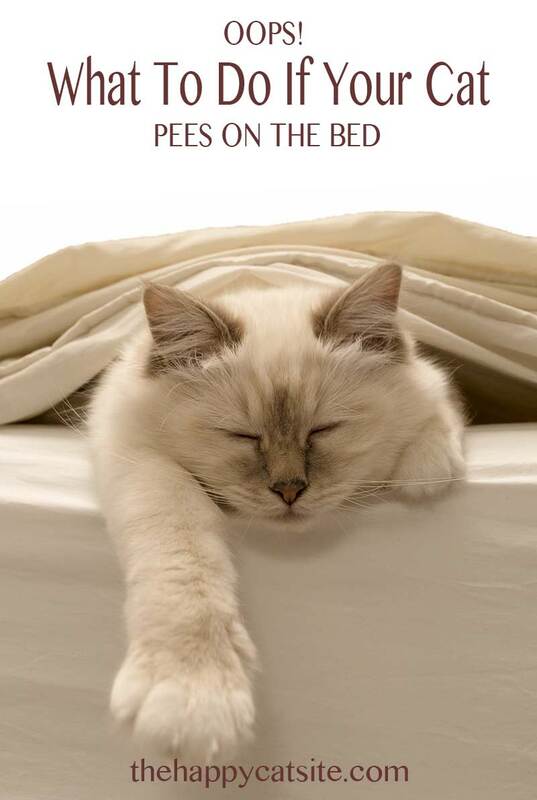 So why do cats pee on beds? In this article, we’ll look at some of the reasons and what we can do to reduce the chances of it recurring. 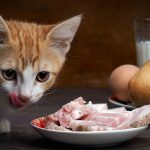 When there is any change in your cat’s elimination habits the first thing you should do is take your cat for a veterinary checkup. This is because there is sometimes a physical reasons such as a bladder infection, for a cat to urinate in unusual places. If your vet finds no physical cause, then we can start addressing the problem from a behavioral perspective. Cats have very particular requirements when it comes to their indoor toilet arrangements. They are more likely to develop inappropriate elimination behaviour if these do not meet with their approval. For example, the litter box might be too small, covered with a hood, perceived as too dirty or too clean. It could be that it is filled with a litter that is uncomfortable or contains a strong-smelling deodoriser. Or even that it is shared between several cats, has a plastic liner, is in a noisy or busy area or is located too close to food. 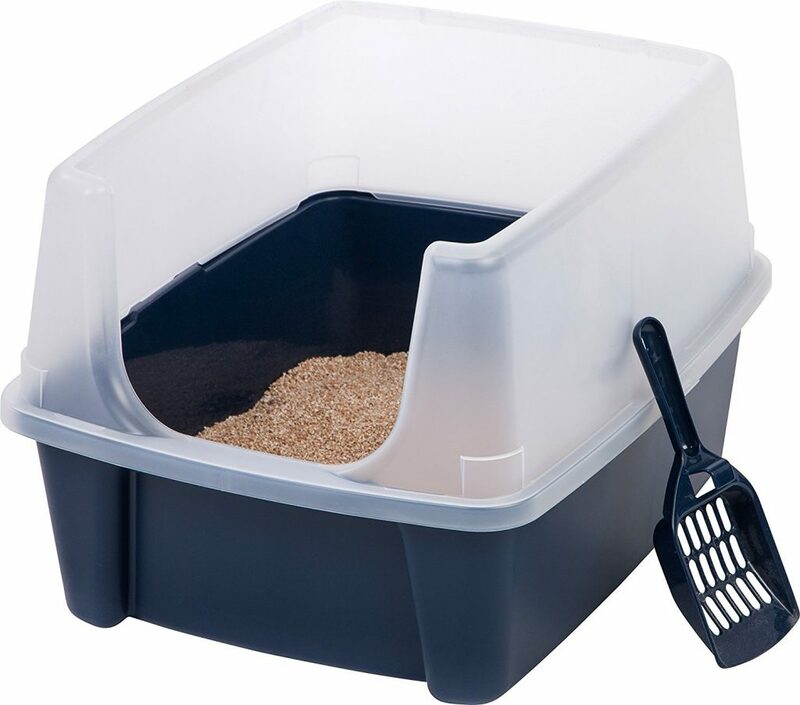 Having the right litter box in the right place, with the right kitty litter, will help your cat want to use it. Negative associations with litter boxes can also be created by cats that have experienced a distressing event in or around it. This could include owners using it to administer medication, or being trapped in the box by children. Or your cat might feel unsafe in the litter box due to the presence of other cats indoors. For some cats being expected to eliminate exclusively outdoors can be very stressful. This is because having a pee temporarily stops them from being able to defend themselves against threat. Other reasons why a cat might vote against their litter box include not wanting to urinate and defecate in the same location and not wanting to use a litter box where other cats have recently eliminated. Environmental upheaval such as building works, a house move, a new baby or even a change in the emotional dynamics of the household could also be to blame. Under such circumstances your cat may seek out alternative sites that fulfil any of his criteria of a suitable toilet. Including a more desirable texture to pee on or location to pee in. But, what is it about our bed that’s so attractive? In most cases, they have a soft, yielding surface, making them super comfortable underfoot. In addition, they are impregnated with your scent and for insecure cats this is wonderfully reassuring. When compared to the tiny shared litter box, next to a washing machine, containing uncomfortable litter, as far as your cat is concerned it’s a no-brainer! Not only will the relief he feels at being able to empty his full bladder in such a fantastic place make him want to choose the same spot the next time he gets the urge, but any residual smell of urine will reinforce that place as a suitable toilet. Then a habit develops and he returns to the same place every time. The answer could lie in the environment in which he was reared, and specifically whether he was conditioned to using a litter box. If the only provision that had been made for him was newspaper on the floor; your brand-new litter box, or the litter it contains may not be his idea of what a toilet looks or feels like. Or it could be to do with what happened on the day you brought him home. It’s not uncommon for owners to place their new little bundle of fluff in the sanctuary of their bedroom. The anxiety created by having been taken away from his mother and siblings and placed in an unfamiliar environment may be enough to trigger a stress-related pee. Or it could just be that in all the excitement the owners have forgotten to place a litter box in the room. If the surface he pees on happens to be the bed, that is enough to create an association in his mind between that location and the act of elimination. 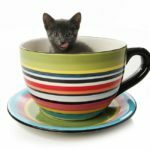 Why is My Cat Urinating on its Bed? 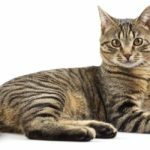 The reasons why your cat might start peeing on his own bed, may be no different to those that cause him to pee on your bed. In other words, the toilet facilities not meeting his requirements. The presence of other cats indoors and/or outdoors or changes within the environment, either physical or emotional that he finds stressful. However, if a previously well house-trained cat pees on a cat bed you’ve just bought for him, it could just be that he perceives it to be a toilet. Even though in our human minds we know the difference between a litter box and a cat bed! This might be not so hard to understand when you think that many traditional cat beds are roughly the same size as a litter box and may be enclosed or semi-enclosed. Once elimination has taken place, and if the bed remains in situ, your cat will thereafter see it as an extension to his existing toilet facilities and continue to use it as such. What a dog’s bed has in common with the cat’s bed and your bed is the surface texture. It’s usually soft and malleable and provides your cat with a comfortable toileting experience. It might also be much bigger than the litter box, be located somewhere more discreet and provide a nice open space from which a cat has a 360-degree view around him which makes it easier for him to see any approaching threats. From a cat peeing on bed perspective, what’s not to like? 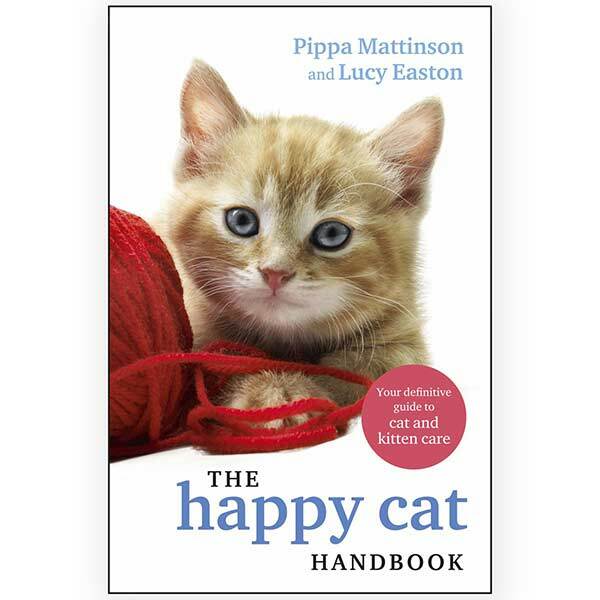 The habit of peeing on the bed can, in theory, be ‘un-learned’, but only if there is no physical cause, the toilet facilities are ideal, opportunities for your cat to experience stress are minimised, and access to the beds is consistently denied for at least several months. If your cat is urinating on your bed but it is not feasible to exclude him from the bedroom, you will need to break the habit of him seeing soft furnishings as a toilet by making the bed uninhabitable. You can achieve this with storage boxes containing items heavy enough to weigh them down such as books, a duvet, pillows etc. Once soiled, cat and dog beds should be removed indefinitely and not be replaced until you have the problem under control. 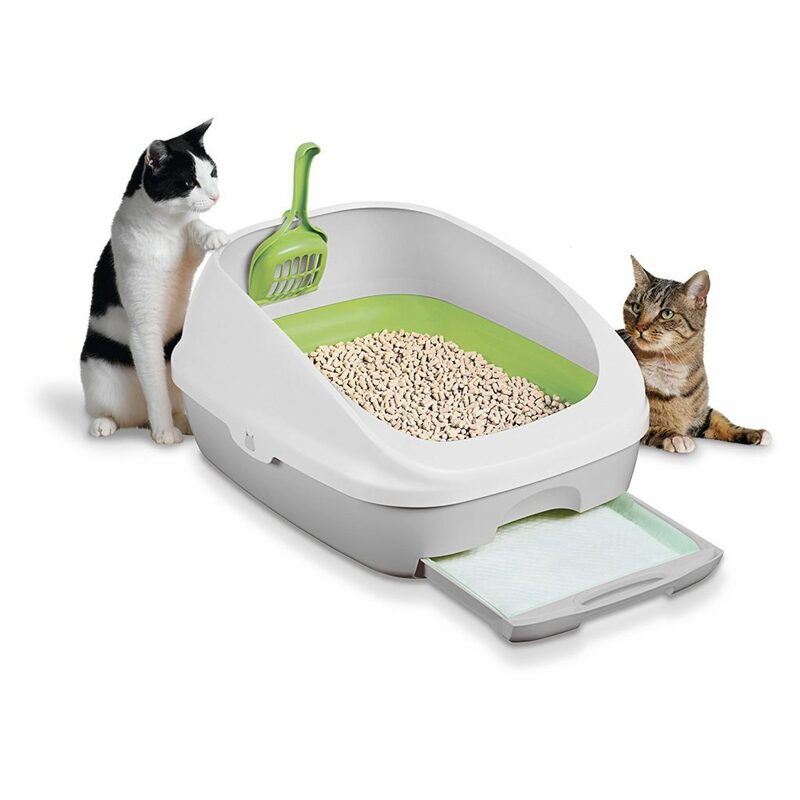 Your next step is to make the cat’s litter boxes more appealing. Let’s look at the ways we can achieve that. Choose somewhere private, away from busy areas and noisy machines. Avoid placing an open litter box next to a window or cat flap so that your cat doesn’t feel threatened by the presence of other cats. If you have more than one box resist the temptation to place them side by side, as your cat will simply view them as a single latrine. Finally, make sure the box is well away from your cat’s food and water. Like us humans, cats would prefer not to eat food placed next to a toilet! Ideally a litter box should be rectangular in shape and one and a half times the length of your cat, measured from the tip of his nose to the base of his tail ie a minimum of 22 x 17 inches (49.5 x 38 cm). This will give him room to move, turn, dig and choose the perfect spot to eliminate within the box. An open box will give your cat the opportunity to keep an eye on what’s going on around him, this can be especially important to him if he lives with other cats. Hooded litter boxes can provide the opportunity for fellow cat-mates to ambush the unsuspecting cat inside when he attempts to exit the box. If you prefer a hooded box, then removing the door will allow your cat to stick his head out and keep an eye out for any approaching threats. Choose a fine, unscented, granular clumping litter that your cat can rake-around whilst not feeling any discomfort on his sensitive paw pads. Avoid using too much or too little litter. A depth of around 3-4cm is usually enough. Though more might be necessary for cats that urinate frequently or for households containing more than one cat. Use an appropriate litter scoop. Those with large holes make it very difficult to remove all the urine clumps. Instead, try a scoop with holes small enough to ensure that not even the tiniest of urine particles ends up back in the box. Where practical, provide one litter box per cat, plus one in a separate location. Even if you have only one cat, giving him the choice of two trays is a good idea as some cats like to pee and poo in separate places. 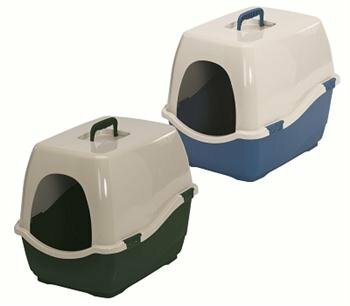 Where no litter boxes are provided, these should be introduced according to the criteria above. For a single cat scoop out urine clumps and solids a couple of times daily. However, you may need to increase this if you have more than one cat using the same box. Once you’re finished scooping, don’t forget to top the litter up to maintain an appropriate depth. Empty the litter box completely once a week. Old litter can be thrown away and the box given a good clean with hot water and washing up liquid. Avoid using any strong-smelling detergents or litter freshening products. Remove any plastic liners as cats can easily get their claws caught in them. Resist the temptation to place your cat in the litter box, this is another way of creating a negative association with it. Never rub your cat’s nose in the soiled area or punish him in any way. He won’t associate what he’s done with your reaction which may not only cause him distress and compromise the relationship, but make the likelihood of the behaviour being repeated greater. 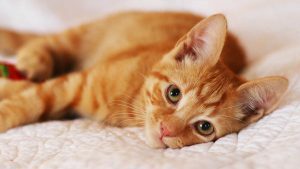 Using Synthetic Pheromones can provide a sense of security and reduce anxiety in cats so having a pheromone diffuser in the area where your cat spends most of his time may promote a sense of well-being and reduce stress-related house soiling. A well-serviced litter box shouldn’t give off an environmental smell. The same however, can’t be said for other areas where a cat might choose to pee. Once a surface has been urinated on it can be very difficult to remove the smell. Generally, the quicker you act the better your chances. Avoid using bleach as this will break down into ammonia compounds which smell very much like cat urine. This is likely to reinforce the idea of that location being a dedicated cat toilet. Instead, soak the urine up with a paper towel then use an enzymatic cat urine cleaner on the soiled area. There are various cleaners available now specifically formulated to remove the stain and odor of cat urine. Some work better than others, so asking your veterinarian for a recommendation is a good idea. Remember, once urine is engrained, then it’s unlikely that anything is going to work, and you may have no option but to replace the soiled item. 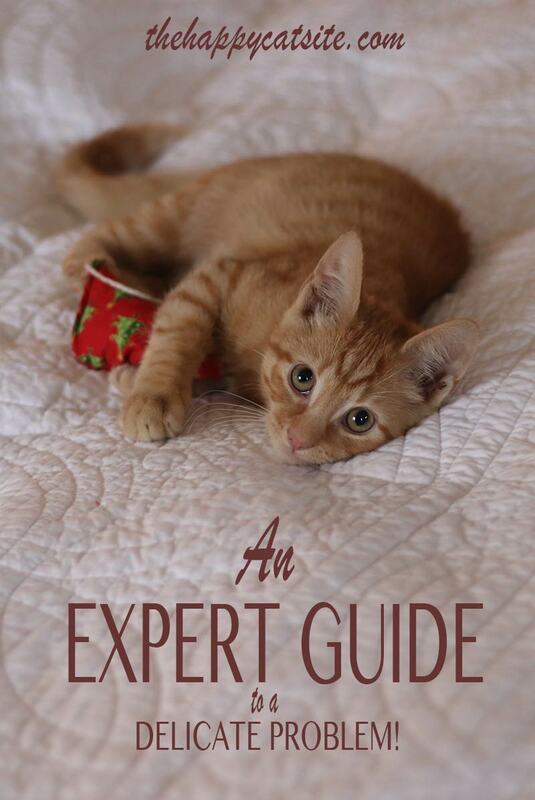 If your cat keeps peeing on your bed, his bed or the dog’s bed it’s worth remembering that each cat is different and there is no one-size fits all solution to the problem. While at the same time making his litter box area very attractive to him. 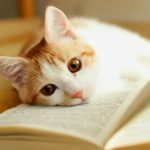 With time and patience you should be able to restore your cat to proper house manners, but if you continue to have problems, don’t hesitate to consult a qualified cat behaviorist. I have a solution from my vet at Timonium Animal Hospital for stopping my cat from urinating on the bed and it is working and easy to do. Once you know that the problem is not medical this is what I did. I have two trays, one with kitty litter for her bowel movements that i just scoop out and the other one with NO kitty litter for urinating. First, I bought four or more bath towels on sale. Then I I folded one of the towels and placed it into the empty tray. I do not wash the urinating tray because i want her to smell it. It does not smell to me but she can smell it . Then i stripped my bed, sprayed it and then when dry I put a plastic cover over the mattress for just in case. Then I made the bed as usual and prayed that it would work. At first she began to walk on the towel and within about two days she began to urinate in the tray. She is now using it and no more urinating on the bed. It is a miracle. I make sure to replace the wet towels with clean ones every other day and wash them in the washing machine alone with regular detergent. Then into the dryer and then into the drawer for storage. My bedroom no longer smells. That’s brilliant! I’m going to try it. My blind kitty will not pee in her box. But on soft stuff. Thanks for the great idea! Thank you so so so very much. This is a GREAT idea. I will try it right away. My cat is 5 yrs old and with in the past couple months she has been peeing on my bed. I took her to the vet and they put her on an antibiotic but has not worked. They want me to get a urine sample using Lima beans. Not sure how that will work either. Please help I dont have the space to do as Virginia recommends.